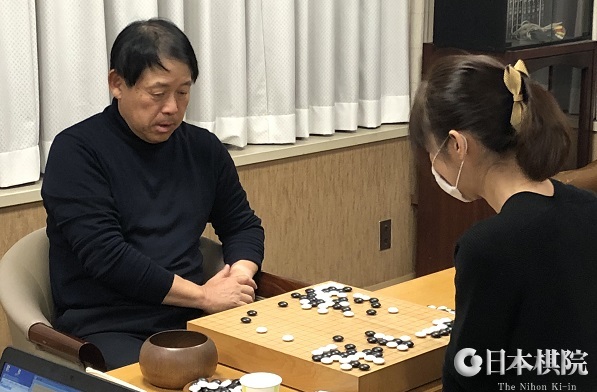 Ishida Yoshio scores 1100th win: In a game in Preliminary C of the 45th Gosei tournament, Ishida Yoshio 9P (also known as 24th Honinbo Shuho) (W) beat Tsurumaru Keiichi 7P by resignation. This was his 1100th official win (to 692 losses and one no-result). He is the 15th player to reach this landmark. 2018 statistics: Here are some of the statistics for last year. These promotions are based on the prize-winnings list, but note that there may be players who won more but were promoted by other means, that is, cumulative wins or entering a league, etc. Only prize money for the top seven titles is counted. One 6-dan is promoted, accompanied by two each from the lower ranks. Promotions take effect as of January 1, 2019. Ueno makes good start in Women’s Kisei: The first game in the 22nd Women’s Kisei title match was held at the Hotel Sunlife Garden in Hiratsuka City, Kanagawa Prefecture, on January 17. The defending champion Ueno Asami (W, at left in photo) beat Fujisawa Rina by 2.5 points after a marathon 310 moves. 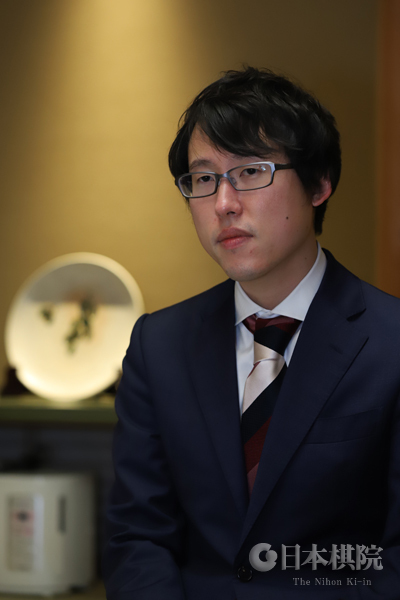 The challenger took the lead in territory early on, but Ueno attacked tenaciously and finally overhauled Fujisawa in the endgame. The second game will be held on January 28. Xie to challenge for Women’s Meijin: Xie Yimin 6P (left) may be titleless for the first time in over a decade, but you can’t keep her out of the action. In the play-off to decide the challenger for the 31stWomen’s Meijin title, she beat Koyama Terumi 6P by resignation after 179 moves. She will challenge Fujisawa Rina for the title. Koyama, who has won this title four times, was hoping to play in her first title match for 13 years. 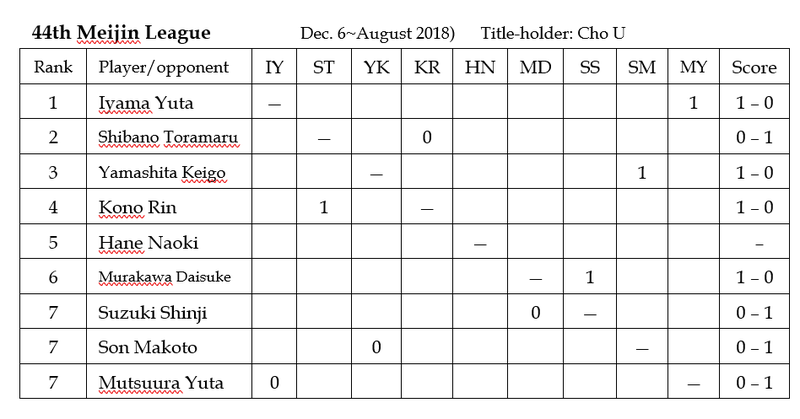 Honinbo League: The fourth round of the 74th Honinbo League has been completed. Instead of one player breaking clear, the position has become complicated, with four players sharing the lead. On January 7, Yamashita Keigo 9P (W) beat Anzai Nobuaki 7P by half a point. That improved Yamashita’s score to 2-2, so he is still in the running to win the league (he’s also helped by his number one ranking). Anzai goes to 0-4, so he looks unlikely to retain his league seat. However, the narrow margin shows that he is not being outclassed. In the second game, played on January 10, Yo Seiki 8P (B) beat Hane Naoki 9P by resig. Yo and Hane are now both on 3-1. The only undefeated player at this point was Ichiriki Ryo 8P, who was on 3-0. 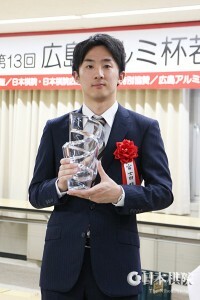 On January 17, he played Shibano Toramaru 7P; taking white, the latter beat him by resignation, so both went to 3-1. On the same day, Kono Rin 9P (W) beat Ko Iso 8P by resignation. Kono improved to 2-2, but Ko went down to 0-4. Ko also looks like losing his place, but being ranked number two gives him a slight advantage over Anzai. Meijin League: Two games in the second round of the 44thMeijin League were played on January 10. Kono Rin 9P (B) beat Mutsuura Yuta 7P by resig. and Shibano Toramaru 7P (W) beat Murakawa Daisuke 8P by 2.5 points. Two more games were played on January 17, and one of them could have a big effect on the league. Suzuki Shinji 7P (B) beat the favorite, Iyama Yuta, by half a point. In the other game, Son Makoto 7P (W) beat Hane Naoki 9P by resignation. On 2-0, Kono is the provisional leader. Judan challenger: Murakawa or Takao: The first semifinal of the 57th Judan tournament was played on December 27, with Takao Shinji 9P (W) beating Yamashita Keigo 9P by 2.5 points. The second was held on January 7. Murakawa Daisuke 8P (W) beat Onishi Ryuhei 4P by resig. Chen Yaoye wins 1st Tianfu Cup: The semifinals of the 1st Tianfu Cup were held on December 21 and the best-of-three final on December 23, 25, and 26. In one semifinal, Chen Yaoye 9P of China (W) defeated Park Junghwan 9P of Korea by resig. In the other, Shin Jinseo 9P of Korea (B) beat Jiang Weijie 9P of China by resig. In the first game of the final, Chen (W) won by resig. 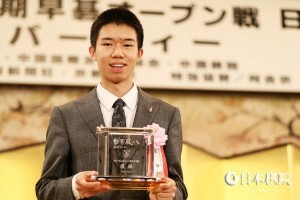 ; in the second, Shin (W) won by 2.5 points. In the deciding game, Chen (B) won by resig. Chen, who turned 29 on December 16, won his third international title; Shin missed the chance to take his first. First prize is 2,000,000 yuan (about $292,000). Iyama makes good start in Kisei: The first game of the 43rd Kisei best-of-seven title match was held at the familiar venue of the Hotel Chinzanso Tokyo in Bunkyo Ward on January 10 and 11. It featured a familiar pairing: Yamashita Keigo challenging Iyama Yuta Kisei for the fourth time, including three times in a row from 2014 to 2016. 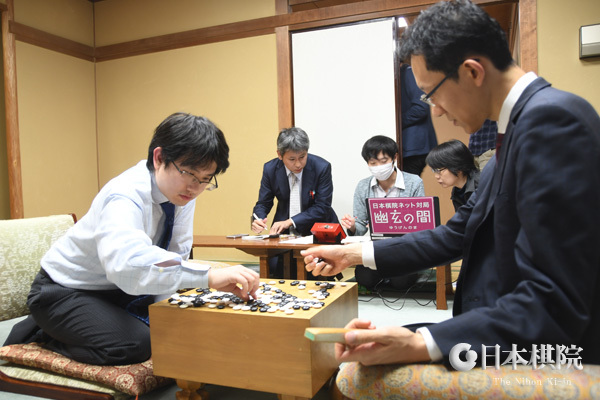 Iyama has held this title for six years in a row; Yamashita (at right in photo, making the first move) has won it five times, including four years in a row. Besides that, Iyama has made one unsuccessful challenge and Yamashita has made unsuccessful challenges to Hane Naoki 9P and Cho U 9P. Yamashita drew black in the nigiri. Yamashita started out by taking the lead in territory, then fell behind, and then upset Iyama’s lead. However, Yamashita apparently thought he was still behind, so he started a risky fight and perished. He resigned after 172 moves. If he had played more peacefully, he would have had a good chance of winning. The second game will be played on January 21 and 22. (Nov. 29) Yamashita Keigo 9P (W) beat Ko Iso 8P by resig. (Dec. 6) Hane Naoki 9P (B) beat Shibano Toramaru 7P by resig. ; Ichiriki Ryo 8P (W) beat Yo Seiki (Yu Chengqi) 8P by resig. (Dec. 13) Kono Rin 9P (B) beat Anzai Nobuaki 7P by resig. (Dec. 6) Iyama Yuta (W) beat Mutsuura Yuta 7P by resig. (Dec. 13) Yamashita Keigo 9P (B) beat Son Makoto 7P by resig. ; Murakawa Daisuke 8P (B) beat Suzuki Shinji 7P by resig. (Dec. 20) Kono Rin 8P (B) beat Shibano Toramaru 7P by resig. This was Kono’s 800th win. Fujisawa to challenge for Women’s Kisei: The play-off to decide the challenger for the 22nd Women’s Kisei title was held in the Ryusei Studio in the basement of the Nihon Ki-in on December 10, and it featured yet another clash between Fujisawa Rina (right) and Xie Yimin. Taking white, the former won by resignation after 174 moves. This is the only women’s title Fujisawa has never won; in fact, it’s the first time she got past the second round (out of four) in the final knock-out section. The best-of-three title match with Ueno Asami will begin on January 17. Incidentally, this will be the first time Fujisawa (20) will face a younger opponent in a title match (Ueno is 17). Chunlan Cup: all-Korean final: Korean players are doing their best to push back against the ascendancy of Chinese players in international tournament recently. The semifinals of the 12th Chunlan Cup were held in Zhejiang Province in China on December 17 and 19. Both featured Chinese-Korean pairings and both ended in narrow victories for the Korean side. Park Junghwan 9P (W) beat Ke Jie by half a point and Park Yonghyun 9P (B) beat Dang Yifei 9P by one and a half points. The final is scheduled for June. 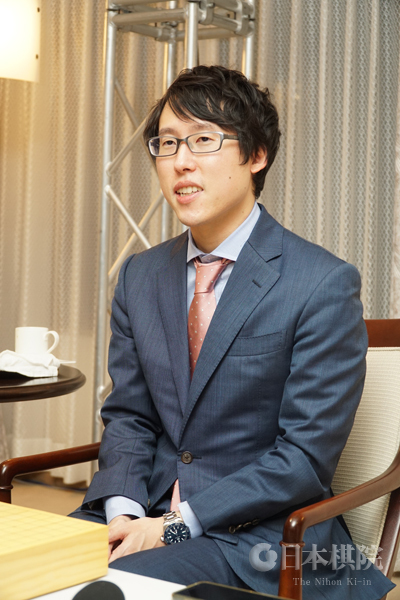 Iyama takes lead in Oza and Tengen: This report is a contrast to my reports of November 2 and 3, which told of losses by Iyama in three different titles. His Meijin title is now gone, reducing him to “just” five top-seven titles, but he has turned the tide in the Oza title match, in which the challenger, Ichiriki Ryo 8P, won the first game. The second and third games were held in quick succession at the same venue, a relatively rare practice but seen occasionally in recent years because of Iyama’s tight schedule. The games were played at the Shima Kanko Hotel (“Kanko” means “sightseeing,” but the hotel doesn’t translate the word in its English name) in Shima City, Mie Prefecture, on November 17 and 19. In the second game, Iyama, taking white, secured a resignation after 196 moves, so he evened in the score. This ended a losing streak of four games for him. In the third game, Iyama, playing black, forced a resignation after 175 moves. Ichiriki will face a kadoban in the fourth game, scheduled for November 30. The third game of the 44th Tengen title match was held at the Yutoku Imari Shrine in Kashima City, Saga Prefecture, on November 23. Taking white, Iyama forced the challenger Yamashita Keigo 9P to resign after 140 wins, so he now leads 2-1. The fourth game will be played on December 10. Fujita wins Young Carp: The main section of the 13th Hiroshima Aluminum Cup Young Carp Tournament was held at the Central Japan Newspaper Building in Hiroshima on November 17 and 18. Sixteen players took part in a knock-out tournament. In the final, Fujita Akihiko 6P (aged 27, at right) (B) beat Koike Yoshihiro 3P (aged 20) by resignation. These two are both disciples of Takabayashi Takuji 6P. Third place was shared by Fujisawa Rina 4P and Adachi Toshimasa 5P. Shibano Toramaru 7P was probably the favorite, but he lost to Koike in the quarterfinals. This tournament is open to professionals 30 and under and 7-dan and under. The time allowance is 30 seconds per move plus ten minutes’ thinking time to be used in one-minute units. First prize is three million yen (about $26,600). 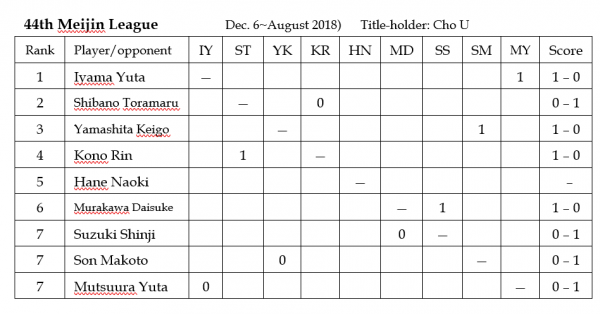 Youngest players & one veteran share lead in Honinbo League: In my previous report, I mentioned that Shibano Toramaru, who just turned 19 on November 9, and Ichiriki Ryo (aged 21) shared the lead in the 74th Honinbo League, on 2-0. They were joined by the 23-year-old Yo Seiki, so the three youngest players in the league shared the lead at this point. Yo improved his score to 2-0 on November 15, when, taking black, he beat Ko Iso 8P by resignation. The final game of the second round was played on November 22. Hane Naoki 9P (W) beat Kono Rin 9P by 2.5 points, so the veteran player (aged 42) joins the above three young players in the lead. Four players are on 2-0 and four on 0-2, so fortunes have been cleanly divided so far. That will change in the third round in December, when Yo will play Ichiriki and Hane will play Shibano. Xie picks up first win in Women’s Honinbo: The third game of the 37th Women’s Honinbo title match was played at the Honinbo Shusaku Memorial Hall on In-no-shima Island, which is part of the mainland city of Onomichi in Hiroshima Prefecture, on November 24. Taking white, Xie won by resignation after 284 moves. Fujisawa Rina won the first two games, but Xie has survived her first kadoban. The fourth game will be played on December 5. Ida defends Crown: The Crown title is a tournament limited to the 40 members of the Central Japan branch of the Nihon Ki-in in Nagoya. In the final, Nakano Hironari 9P challenged the title-holder Ida Atsushi 8P. Playing white, Ida won by 2.5 points. He has now held this title three years in a row. To 3-dan: Bian Wenkai (40 wins, as of Nov. 16). Bian, who was born in China, is a member of the Central Japan (Nagoya) branch of the Nihon Ki-in. He became a professional in 2013 at the age of 20. To 5-dan: Takekiyo Isamu (70 wins, as of Nov. 23). Born in 1979, Takekiyo became a professional in 2001. To 9-dan: Takanashi Seiken (200 wins, as of Nov. 23). Takanashi was promoted to 8-dan in 2002, so it has taken him 16 years to accumulate the wins required to make 9-dan. He is the 78th (active) 9-dan at the Nihon Ki-in (there are 31 at the Kansai Ki-in). Samsung Cup: Ke v. Ahn, China v. Korea: The best-of-three semifinals for the 23rd Samsung Cup were held at a Samsung Research Center in Taeon City, Korea. (Game 1, Nov. 5) Ke Jie 9P (China) (W) beat Xie Erhao 9P (China) by resig. ; Ahn Kukhyun 8P (Korea) (W) beat Tang Weixing 9P (China) by resig. (Game 2, Nov. 6) Xie (W) beat Ke by 1.5 points; Ahn (B) beat Tang by resig. (Game 3, Nov. 7) Ke (W) beat Xie by resig. Ke and Ahn will meet in the best-of-three final on December 3, 4 and 5. Ke will be vying for his sixth international title; Ahn will be making his debut in an international final. 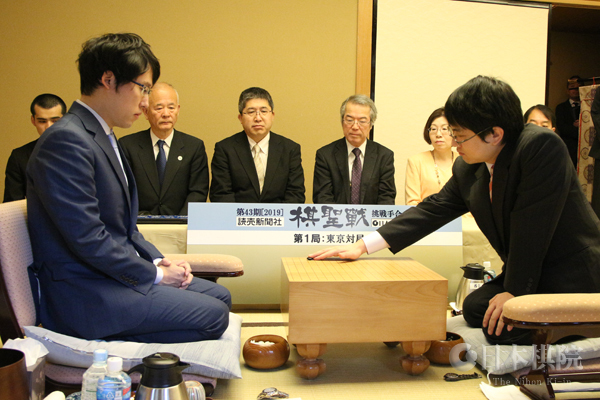 Yamashita becomes Kisei challenger, sets record: The play-off to decide the challenger for the 43rd Kisei title was held at the Tokyo headquarters of the Nihon Ki-in in Tokyo on November 9. It featured Yamashita Keigo 9P (left), winner of the S League, and Kono Rin 9P (right), who was second in the S League but who earned his seat in the play-off by defeating Onishi Ryuhei 3P in the final knockout tournament. Taking white, Yamashita beat Kono by resignation. Although the final is called a “best-of-three,” this was enough for Yamashita to win it, as the S League winner starts with a one-game advantage. Unusually for a big game, this also marked a landmark in Yamashita’s career: his 1,000th win. He is the 24th player in Japan to reach this mark and, at 25 years seven months, the fastest. He broke the record set by Yuki Satoshi 9P of the Kansai Ki-in of 27 years one month. The title match with Iyama Yuta will start on January 10. 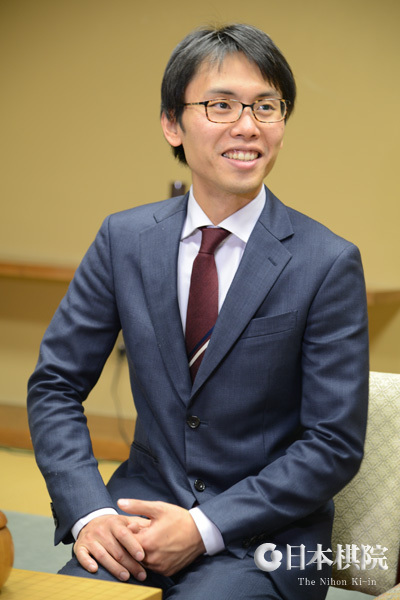 The Kisei will be a familiar arena for Yamashita, as he held the title for one term in 2003 (the 27th Kisei) and for four years in a row from 2006 to 2009 (30th to 33rd). He also made three unsuccessful challenges in a row to Iyama Yuta: he lost the 38th to 40th title matches (2014 to 2016) 2-4, 3-4, and 0-4 in sequence. This may be a good time to challenge Iyama, as he seems a little vulnerable recently. First, though, Yamashita has to try to win the Tengen title match between the two that at this point was tied 1-1. Victory in this match would give him a good springboard for the New Year. Fujisawa extends lead in Women’s Honinbo challenge: The second game of the 37th Women’s Honinbo title match was held at the headquarters of the Nihon Ki-in on November 9. Playing white, Fujisawa Rina forced the title-holder Xie Yimin to resign after 212 moves. Fujisawa also won the first game, so she needs just one more win to take the title. The third game will be held on November 24. New faces in Meijin League: The final play-offs for the three vacant seats in the 44th Meijin League were all held on November 8 but at three different locations. At the Nihon Ki-in in Tokyo, Mutsuura Yuta 7P (W, right) beat Ko Iso 8P by resig. At the Nagoya branch, Suzuki Shinji 7P (W) beat Shida Tatsuya 7P by half a point. At the Kansai Ki-in, Son Makoto 6P (B, left) beat Fujii Shuya 7P (a member of the Kansai Ki-in) by resig. All three players will be making their league debuts. Son also earned a promotion to 7-dan, dated as of the following day. Matsuura’s win was his eighth and Son’s his seventh in ongoing streaks.